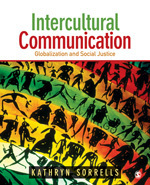 Intercultural Communication: Globalization and Social Justice provides fresh voice and much-needed current perspective on intercultural communication competence. Written as an undergraduate and graduate level text, as a 30+ year professional I also read it enthusiastically. From Sorrells’ debunking of racial color blindness (p. 62), to the commodification of culture (p. 190), to her closing call for global citizenship (p. 227), her keen intellect and passionate commitment to social justice is evident and unwavering throughout. By page 38, I knew I was in good hands, as Sorrells wove Amy Chua and her World on Fire into the intercultural mix, providing it as counterpoint to Francis Fukuyama’s The End of History and the Last Man. how do the complexities and contradictions play out in our world today, particularly in terms of equity and justice? Sorrells is an excellent teacher, providing rich yet succinct examples—unraveling the various interwoven threads of her stories to enable the reader to more clearly see each thread—while keeping the overall tapestry in mind. Her writing should energize and guide cadres of undergraduates, as well as professionals, to use intercultural communication theory and practice to bring more equity and justice to our world. Sorrells covers the content you’d typically expect in a basic text on intercultural communication: nonverbal communication, context, dialogue, relationships, communication style, identity theory, use of space. What makes this book different is that she uses important current issues and topics to provide a fresh perspective and powerful, meaningful insight. She examines intercultural communication informed by topics such as power, hegemony, growing socio-economic inequities, the culture of capitalism, race, color-blindness, immigration, glocalization, hip-hop culture, appropriation, hybrid cultures, and online communication. She pulls from a variety of disciplines including feminist theory to address her topic. In the process, she introduced to this practitioner new ideas such as fragmegration (p. 131), culture jamming (p. 144) and polysemic space (p. 91). The book begins by looking at why the intercultural field has not been able to settle on one definition of culture, tracing definitions of culture from anthropology, cultural studies, and globalization. The author next guides us through a much-needed review of the history of intercultural communication, doing so crisply and meaningfully. Revisiting the origins of the field may help us return to our collaborative purposes and away from the overly analytical comparative studies trends of today. Each chapter concludes with discussion activities and questions, which for a trainer or coach will be invaluable. And they’ll make lesson planning for the classroom easy. Obviously the text is not intended for a basic-level reader of English! And, while this praxis model is definitely conceptually sound, it is far from easy to put into practice. The author’s reference to modern-day anthropologists Jonathan Xavier Inda and Renato Rosaldo was also valuable. Their premise is that culture, in the context of globalization, has been “deterritorialized.” What this means is that “cultural subjects (people) and cultural objects (film, food, traditions, and ideas) are uprooted from their ‘situatedness’ in a particular physical, geographic location and reterritorialized, or relocated in new, multiple and varied geographic spaces,” (p. 43). There were two very minor disappointments for me, amidst all the positives in this text. The first is that while this volume includes a great deal of content that other intercultural texts omit, Sorrells does not adequately address religion and its role in society today. The clash of religious and spiritual beliefs, the gaps between believers and non-believers, the judgments one to another, the fact that religion can provide access to power or motive for distrust, are important. Religion can divide or unite communities, nations, and continents. A chapter or at least a couple of pages devoted to the topic, as seen through Sorrells’ keen perspective, would be a valuable addition. Second, while the book is overflowing with examples from all over the world, it is unnecessarily US-centered. Perhaps a US publisher wanted the book to sell to US universities, and thus preferred it be written that way. This could so easily have been a non-nation-centric book—with an even bigger market. It comes so very close that it seems a shame not to have gone the extra step. Intercultural Communication: Globalization and Social Justice is a must-read for any intercultural professional or serious student of the field. And if you have the pleasure of teaching an intercultural communications class, this is a terrific new text. This entry was posted in Book reviews and tagged Amitabh Bachchan, Amy Chua, Cross-cultural communication, cross-cultural skills, Cultural Detective, current events from an intercultural perspective, diversity and inclusion, Education and Training, Francis Fukuyama, Globalization, Intercultural Communication, intercultural competence, Renato Rosaldo, Sage Publications by Dianne Hofner Saphiere. Bookmark the permalink. Thank you for bringing this kind of books to our attention as Cultural Detectives. I feel like screaming: there is no such thing as social justice, get with it and move on, people!!! Coming from a part of the world (Eastern Europe) where hundreds, thousands and milions of people have fought and suffered for this idea of social justice, just to find out that it’s an illusion….not sustainable in the face of globalised information cicles….not worth pursuing if wealth is something one can achieve within half a life time…I just can’t be silent anymore, especially not in my own beloved community of interculturalists. When will this culturally biased imperialistic movement called “more equality makes more social justice” ever wake up to reality instead of teaching generation after generation to continue agitating against a lost case? From my point of view social injustice has everything to do with poverty. From material poverty over to the poverty of the mind and soul, it is a matter of missing education and know-how that allows all those millions of human beings around the world to be exploited and taken advantage of. Whatever the publisher might have thought when taking this material on, it’s only an example of U.S. cultural bias to me. Thank you for sharing your thoughts, Dianne! Oh, Rita dear, thank you for sharing this, from the depths of your soul. I trust that there is so very much truth in what you say, in what you know, and I for one would love to hear more. Please, write a bit more explanation? You are saying social justice has everything to do with poverty but not with equality? And, yes, definitely to do with education and empowerment. And that giving people hope or optimism, or urging them to act, is counterproductive? How would you like to see interculturalists best proceed around these issues? For one, I would love to see interculturalists working with refugees, immigrants and very importantly with the children of these people. They need our help and insight the most of all, as the adults usually have no means to articulate, what they are going through; lack of orientation in the new cultural and political system being the largest problem I can see. Secondly, before urging anybody to act (in any self chosen way), wouldn’t it be smarter to secure the educational systems to be much better equiped and accessible to everybody around the world? Especially in the Western World? This is what upsets me so much: all this talk about equality seems to stop as soon as it comes to higher education. Only those who can finance it, will get it. How is that respecting the value of equal chances? And thirdly, yes, giving people hope and optimism is allways good and important, but it’s counterproductive to mix it with the messages of a political system of a foreign country, i.e. teachings about social justice in an environment made up of economically underdeveloped infrastructure is similar to a slap in the face of all previous generations, don’t you think? Oh, Rita, thank you for amplifying your perspective. I “get” the context from which you’re speaking much better now. And, yes, opportunity to education and particularly higher education would seem to be key. And this matter of not disrespecting, or of slapping in the face, previous generations. Huge. It reminds me of Tereza’s recent blog post here about the ghosts of our ancestors and the sacredness of place. All too easy or common to forget our interconnectedness. Thank you for taking the time to help me understand your view a bit more!